In the past decade, increased processing capacity combined with precision robotics in high resolution spectrometers has resulted in a new generation of high-speed hyperspectral core logging systems. The application of these multisensor automated platforms provides a key advancement in the characterisation of metal resources. The development of this technology has allowed for comprehensive, drill core-based, mine-scale rock mass characterisation studies. Here we propose a new method for the extraction of parameters that seek to more accurately quantify ground conditions, including quantified rock mass rating (RMR) and the Rock Tunnelling Quality (Q) Index. Data inputs include rock quality designation (RQD), number of joint sets, joint roughness, joint alteration and joint spacing. Geologists and geotechnical engineers have historically collected these inputs by manually logging drill core. With automated core scanning technologies, these parameters can be estimated from the acquired image data and used to objectively calculate RMR and Q-index values for oriented core. Corescan is an automated hyperspectral core scanner that uses a 3D laser profiling system to measure the height of the surface of drill core. This technology allows for rapid core analysis to produce detailed fracture and rock condition data. Through an integrated geometallurgical approach, the proposed methodology will test the accuracy of joint measurement using the height profile Corescan data from oriented drill core. This will be combined with joint roughness and alteration mineralogy measured from the hyperspectral images to calculate the RMR and the Q-index continuously downhole. The values obtained can then be compared to the traditional, manual geotechnical log data. 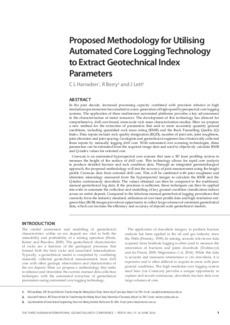 If the precision is sufficient, these techniques can then be applied site-wide to automate the collection and modelling of key ground condition classification indices across an entire deposit. Compared to the laborious manual geotechnical logging procedures that currently form the industry standard, utilisation of core laser profile data and high resolution red-green-blue (RGB) images provide an opportunity to collect large volumes of consistent geotechnical data, which can increase the efficiency and accuracy of deposit scale geotechnical models.